Yule is celebrated at the winter Solstice, and the precise date is governed by the astronomical forces of the universe, but it's typically around December 21st or 22nd. This the time of the longest night of the year, and shortest day. From this day onward, the days will start getting longer. So we celebrate the return of light and warmth of the Sun. Along a more mythological story-line, the God is reborn at Yule after sacrificing himself at Samhain' s harvest. The Goddess has mourned him through the dark months of November and December, and now rejoices at his return. 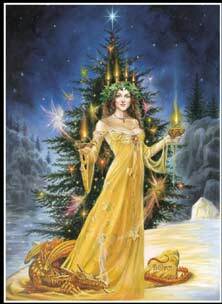 She is seen in her virgin, Maiden aspect at this time of year. This idea of rebirth, is how Yule got tied in with the Christian story of the birth of Jesus. Though the holiday has become heavily Christianized, most of the traditions are based on older, Pagan beliefs. Yule Log - A special log was chosen on the eve of Yule, for the holiday fire. A small piece from last year's log is used to light the fire. Charred pieces from the fire would be kept to protect the house through the coming year. Today, the Yule log is sometimes represented as a log cake instead. Or a small log is decorated with candles. Tree Decorating - There is some debate on the origin of this tradition. Druids (and some other ancient cultures) saw evergreen trees as symbols of everlasting life, because they seemed to live through the winter undaunted by the cold. So using evergreen branches as decorations symbolized the undying strength of the Sun. Decorating the trees may have come from the ancient Roman festival of Saturnalia (held around the Solstice). Gift Giving - The Christians attribute the giving of gifts at Christmas to the three wise men who brought gold, frankincense and myrrh to the newborn Jesus. But this tradition was common well before the time of Jesus, during Saturnalia. At midwinter mistletoe was ceremoniously lopped lopped from the oak tree, caught in a cloth so it did not touch the earth and laid on the solstice altar to represent fertility. Kissing Under Mistletoe - The roots of this habit are unknown, but is likely tied with the fertility aspects of mistletoe and that it was viewed as a bringer of peace by the Druids. Some earlier versions of this tradition say to remove one berry with each kiss. When there are no more berries on the sprig of mistletoe, no more kisses. Sacred to mother Holle, or Hel, the Underworld Goddess. Holly is one of the native trees favoured by the Druids and part of the Celtic Tree Ogham. Symbolizing everlasting life, recovery, goodwill and potent life energy. A tree of death and regeneration, it unites past actions and present actions. Red Holly berries represent the red female blood of life. Holly and mistletoe are displayed together to represent the sacred marriage which brings forth new life. Ancient Romans welcomed winter with the festival of Saturnalia, honoring Saturn, the god of agriculture. People decorated their houses with evergreen branches and lit lamps all night to ward off the darkness. Across time, people have marked the change of seasons. The ancient Celts hung golden apples and lit candles on oak trees to celebrate the winter solstice. In 3200 B.C., ancient people in Ireland build a huge knoll called Newgrange. For 5 days over the winter solstice period, a beam of sunlight illuminates a small room inside the knoll for 17 minutes at dawn.